Personal-injury attorneys are moving quickly to capitalize on a new government study showing that the popular hormone-replacement drug, Prempro, greatly increases the risks of breast cancer, heart attacks, strokes, and blood clots. At least five class actions have been filed already and lawyers around the country are preparing to file more, along with hundreds of individual suits. About three million women in the U.S. regularly take Prempro to relieve hot flashes and other symptoms of menopause, to preserve bone strength and because the drug was thought to reduce the risk of heart attacks. After the study's findings were announced on July 9, women overwhelmed doctors' offices with calls. And many have been calling lawyers as well. Chicago Attorney Kenneth Moll, who has filed a class action, said that more than 3,000 women have called and asked to be part of the suit. New York attorney Samuel Davis has not yet filed a suit, but said he is gathering medical records for at least 300 women who have contacted his office with potential claims. Boston attorney Michael Hugo said he is investigating claims for about 100 women. Given the number of women who have taken Prempro and the seriousness of the injuries involved, lawyers see the potential for one of the largest mass tort litigations ever. However, lawyers cautioned that it's far too early to tell how successful the cause of action will be. They said the biggest obstacle is likely to be proving that the drug caused individual women's injuries. "The $64,000 question," said Davis, "is how can you rule out that the woman would not have had breast cancer anyway?" Prempro, which contains the hormones estrogen and progestin, was first sold in 1995. It is manufactured by Wyeth Inc. of New Jersey. Studies of the drug prior to the new study were generally very positive. They suggested not only that short-term use would relieve the symptoms of menopause, but also that long-term use would greatly reduce the risks of heart attacks and bone fractures in older women, with only a small possible increase in the risk of breast cancer. Those studies, however, merely compared women who had decided to take the drug with those who hadn't. So it was never clear whether the drug made women healthy, or whether the women who tended to take the drug were healthier to begin with. The new study, on the other hand, was a controlled study, in which over 16,000 women ages 50 to 79 were divided into two groups, one given the drug and the other a placebo. It also was "double-blind," in that neither the women nor their doctors knew whether they were getting the drug or the placebo. The study began in 1997 and was scheduled to continue for eight years, until 2005. But, because of the data showing the drug's harmful effects, researchers decided to terminate it last May. They said it was clear that, for women using the drug for five years or more, the risks exceeded the benefits, and they urged all women in the study to stop taking their pills. The study found that Prempro increased the risk of breast cancer by 26 percent, heart attacks by 29 percent, strokes by 41 percent, and blood clots by 113 percent. It predicted that for every million women using the drug for five years or more, there would annually be an additional 800 cases of breast cancer, 700 heart attacks, 800 strokes and 800 blood clots. The benefits of the drug revealed by the study were a 24 percent reduction in the risk of bone fractures and a 37 percent reduction in the risk of colorectal cancer. As for short-term use of the drug, the study found an increased risk of heart attacks and blood clots even in the first year women were on the drug, and an increased risk of strokes during the second year, but it did not attempt to compare these risks with the short-term benefits, such as relief from hot flashes. The study does not necessarily apply to drugs other than Prempro that also combine estrogen and progestin - although researchers warned that these other drugs should not be assumed to be any safer. There are a number of such drugs, including ones that use lower dosages than Prempro, and ones that are applied to the skin rather than taken orally. But Prempro is by far the most widely used. So far, at least three nationwide class actions have been filed against Wyeth on behalf of all women who have ever taken Prempro. The suits seek compensation for personal injuries, as well as funds for medical monitoring. They allege various theories of liability based on negligence, strict liability and breach of warranty. Two statewide class actions have also been filed in Florida and Pennsylvania seeking funds for medical monitoring. In addition, the Pennsylvania suit seeks reimbursement of money paid to Wyeth for the drugs. Lawyers are considering filing additional class actions and are investigating numerous individual cases. "We are very thoroughly investigating each case, pulling clients' medical records and consulting experts," Davis said. "We're not shooting first and aiming later." Hugo said he is doing the same and expects to file a number of individual lawsuits within a week or two. In screening cases, lawyers are looking especially for women who have taken Prempro for at least a few years and who, except for taking the drug, would not have a high risk of developing their illness. For instance, a woman with breast cancer may have a strong case if she doesn't smoke and doesn't have a family history of the disease. Some lawyers are considering breast cancer cases only if the woman has been on the drug for five years or longer. Some are further limiting their cases to ones involving Prempro, but other are also considering suits over other types of estrogen-progestin drugs. Lawyers are looking at a number of theories of liability, which mainly hinge on whether Wyeth was entirely forthright in what is disclosed about Prempro's risks and benefits. According to Philadelphia plaintiffs' attorney Mark Rifkin, "It comes down to, "What did they know, when did they know it, and what did they say about it?" Probably the strongest evidence of liability would be if Wyeth failed to disclose relevant information. 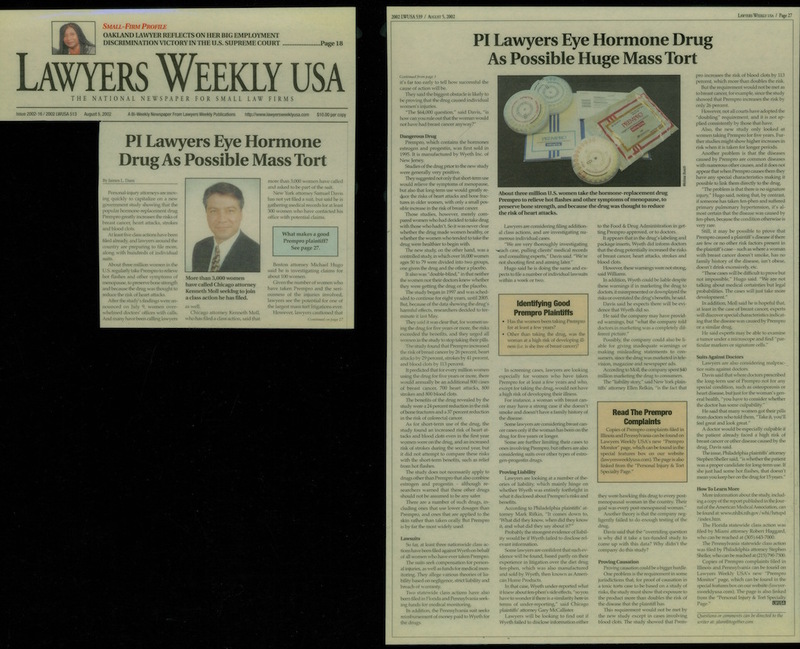 Some lawyers are confident that such evidence will be found, based partly on their experience in litigation over the diet drug fen-phen, which was also manufactured and sold by Wyeth, then known as American Home Products. In that case, Wyeth under-reported what it knew about fen-phen's side effects, "so you have to wonder if there is a similarity here in terms of under-reporting," said Chicago plaintiff's attorney, Gary McCallister. Lawyers will be looking to find out if Wyeth failed to disclose information either to the food & Drug Administration in getting Prempro approved, or to doctors. It appears that in the drug's labeling and package inserts, Wyeth did inform doctors that the drug potentially increased the risks of breast cancer, heart attacks, strokes and blood clots. However, these warning were not strong, said Williams. In addition, Wyeth could be liable despite these warnings if in marketing the drug to doctors, it misrepresented or downplayed the risks or overstated the drug's benefits, he said. David said he expects there will be evidence that Wyeth did so. He said the company may have provided warnings, but "what the company told doctors in marketing was a completely different picture." Possibly, the company could also be liable for giving inadequate warnings or making misleading statements to consumers, since the drug was marketed in television, magazine and newspaper ads. According to Moll, the company spent $40 million marketing the drug to consumers. The "liability story," said New York plaintiffs' attorney Ellen Relkin, "is the fact that they were hawking this drug to every post-menopausal woman in the country. Their goal was every post-menopausal woman." Another theory is that the company negligently failed to do enough testing of the drug. Davis said that the "overriding question is why did it take a tax-funded study to come up with this data? Why didn't the company do this study? Proving causation could be a bigger hurdle. One problem is the requirement in some jurisdictions that, for proof of causation in a toxic torts case to be based on a study of risks, the study must show that exposure to the product more than doubles the risk of the disease that the plaintiff has. This requirement would not be met by the new study except in cases involving blood clots. The study showed that Prempro increases the risk of blood clots by 113 percent, which more than doubles the risk. But the requirement would not be met as to breast cancer, for example, since the study showed that Prempro increases the risk by only 26 percent. However, not all courts have adopted the "doubling" requirement and it is not applied consistently by those that have. Also, the new study only looked at women taking Prempro for five years. Further studies might show higher increases in risk when it is taken for longer periods. Another problem is that the diseases caused by Prempro are common diseases with numerous other causes, and it does not appear that when Prempro causes them they have any special characteristics making it possible to link them directly to the drug. "The problem is that there is no signature injury," Hugo said, noting that, by contrast, if someone has taken fen-phen and suffered primary pulmonary hypertension, it's almost certain that the disease was caused by fen-phen, because the condition otherwise is very rare. Still, it may be possible to prove that Prempro caused a plaintiff's disease if there are few or no other risk factors present in the plaintiff's case - such as where a woman with breast cancer doesn't smoke, has no family history of the disease, isn't obese, doesn't drink excessively, etc. "These cases will be difficult to prove but not impossible," Hugo said. "We are not talking about medical certainties but legal probabilities. The cases will just take more development." In addition, Moll said he is hopeful that, at least in the case of breast cancer, expert will discover special characteristics indicating that the disease was caused by Prempro or a similar drug. He said that experts may be able to examine a tumor under a microscope and find "particular markers or signature cells." Lawyers are also considering malpractice suits against doctors. David said that where doctors prescribed the long-term use of Prempro not for any special condition, such as osteoporosis or heart disease, but just for the woman's general health, "you have to consider whether the doctor has some culpability." He said that many women got their pills from doctors who told them, "Take it, you'll feel great and look great." A doctor would be especially culpable if the patient already faced a high risk of breast cancer or other disease caused by the drug, David said. The issue, Philadelphia plaintiffs' attorney Stephen Sheller said, "is whether patient was a proper candidate for long-term use. If she just had some hot flashes, that doesn't mean you keep her on the drug for 15 years. More information about the study, including a copy of the report published in the Journal of the American Medical association, can be found at: www.nhlbi.nih.gov/whi/hrtupd/index.html. The Florida statewide class action was filed by Miami attorney Robert Haggard, who can be reached at (305) 643-7000. The Pennsylvania statewide class action was filed by Philadelphia attorney Stephen Sheller, who can be reached as (215) 790-7300. Copies of Prempro complaints filled in Illinois and Pennsylvania can be found on Lawyers Weekly USA's new "Prempro Monitor" page, which can be found in the special features box on our website (www.lawyersweeklyusa.com). The page is also linked from the "Personal Injury & Tort Specialty Page"